Both open surgical repair (OSR) and endovascular repair (EVAR) are characterized by possible early and long-term effects on renal function. In particular, contrast-induced nephropathy, endoluminal manipulation of juxtarenal aorta, the use of endografts with transrenal fixation, and the repeated contrast dye administration during follow-up may affect renal function in patients treated with EVAR. Furthermore, the use of endovascular techniques to treat juxtarenal and pararenal aneurysms (Chimney technique, fenestrated and branched endografts) raises additional concerns due to the need for renal artery cannulation and stenting. 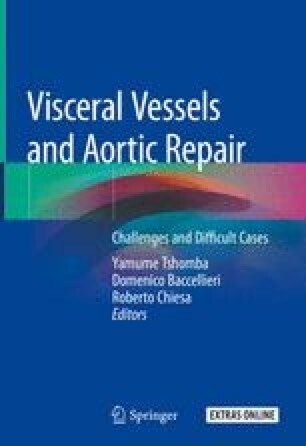 This chapter aims to review more than 10 years’ experience in the study of renal function following aortic surgery, with particular attention to long-term outcomes.